The impact a piping material has on the environment in terms of emissions into the atmosphere, soil and water, landscape scarring, and the potential for extended service life and recycling is assessed in cradle-to-grave environmental impact studies. Polybutene-1 has been rated as having low environmental impact in comparison with alternative piping materials including metals and other plastics. The total impact a material has on the environment from material and product manufacture to usage in its intended markets, to recycling, is assessed in what is known as a 'cradle to grave' study. Such a study was conducted by the Technical University of Berlin on various drinking water pipe installation systems, including metals: galvanised steel and copper, and plastics: Polybutene-1 (PB-1), cross-linked polyethylene (PE-X), polypropylene (PP-R), and chlorinated polyvinylchloride (PVC-C). The EU guidelines for sustainable buildings demand that the impact on the environment and the associated consumption of energy costs and resources is minimised throughout all phases of the life cycle of a building from planning to demolition. Ore mining of metals, which is predominantly open cast mining, results in a lasting scar on the landscape. The fraction of metal extracted from the ore (1 to 2%) exacerbates this problem. Crude oil in contrast is extracted via a bore-hole and consequently has much less of a lasting effect on the landscape. 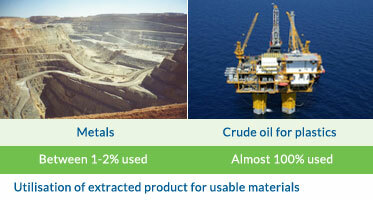 Furthermore, almost 100% of crude oil is subsequently converted into useable products e.g. oils, fuels and chemicals. In contrast to metals refining, plastics polymerisation processes are essentially fully integrated, generating very low emissions. The refining and smelting of metals consumes far more energy than the refining of oil and polymerisation of plastics. The emissions from metals production processes in terms of soil, air and water pollution also far exceed the impact of oil refining and plastics polymerisation. The emissions into soil from metal refining are increased due to the large fraction of the electrical energy used for smelting being generated by coal combustion. The ore residues together with the ashes from power production have a considerable polluting effect on the landscape. For both metals and plastics the production of pipes and fittings involves raising the temperature of the raw materials above their melting/softening points. The temperatures involved however are much higher for metals in comparison with plastics, with consequential differences in energy efficiency ratings. The actual weight of a piping network is not considered to be a factor in building installations. But it is important in assessing the overall energy efficiency of the piping system. Due to their much lighter weight, plastic materials exhibit a distinct advantage over metal pipes in this respect. The total energy consumption to manufacture metal pipes required for the piping system of, for instance, a 16-family housing complex is significantly higher than for plastic piping systems. Due principally to their lighter weight, plastics materials had a distinct advantage over metal pipes, but the Polybutene-1 piping system proved to be 50% lower in total energy consumption than the other plastics systems included in the study. This was due to its superior internal pressure performance, permitting the utilisation of pipes with smaller wall thickness. Two considerations should be taken into account with respect to the applicational life expectancy of a piping installation. First of all, the lifetime of a system delays the need for replacement, and this assists the reduction of environmental impact on a time-dependent scale. Secondly, when a material has completed its useful applicational life, its environmental impact is also reduced if it can be recycled. Both metal and polyolefin thermoplastics, including Polybutene-1, can be recycled. However, since the plastic piping systems are expected by standards accreditation to provide a service life in excess of 50 years, it is difficult to reliably predict the environmental impact of recycling on such an extended timescale.